Post#6 — the Colonel: This character is part of my Chrono Tigers series. He belongs to a steampunk science fiction world of the late 19th century. 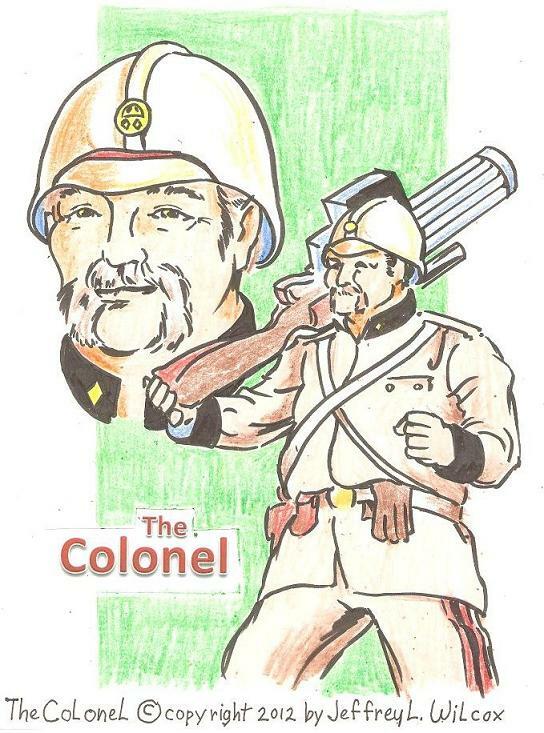 Located in London, England, the Colonel is the nickname for the ex-military Lionel Davis. He is part of an organization that does time travel( Her Majesty’s Time Agents). There the Colonel is part of a team of agents (the Chrono Tigers) that fix and amend troubles within the time stream. As such, the Colonel and his team mates have been on missions that have lead them from ancient Egyt to the British colony on Mars. The Colonel (Lionel Davis) is the heavy equiptment carrier for the Chrono Tigers. He tries to carry the heaviest guns, carries a large amount of the luggage the team sometimes has to have, and tries his best to project himself as a larger than life personality. This, however, belays his soft heart, which is seen in moments of disaster and the sight of small children ( he has been married before, but for some reason has lost his wife and children).